Netherlands-based Heineken is the second largest beer brewery in the world, with over 165 breweries in more than 70 countries. Over the years, product offerings have expanded to include the original Heineken along with more than 250 international brands, craft and variety beers, and ciders. Due to its international presence and expanded lines, the brewer had multifaceted goals, one of which is its latest Drinkies project in the South East Asia region. 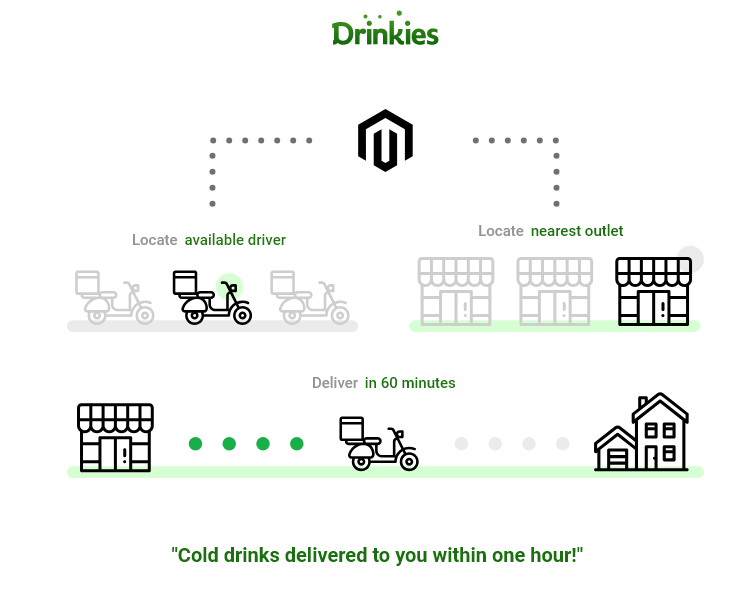 The idea of Drinkies is to bring the cold drinks right to the customer’s doorstep within a 60-minute-delivery. This model is Heineken’s first step in its “Drink responsibly” movement, by providing a fast and reliable delivery solution so customers don’t have to go out to pick up their drinks, the company could reduce the traffic accident rate caused by drinking and driving. 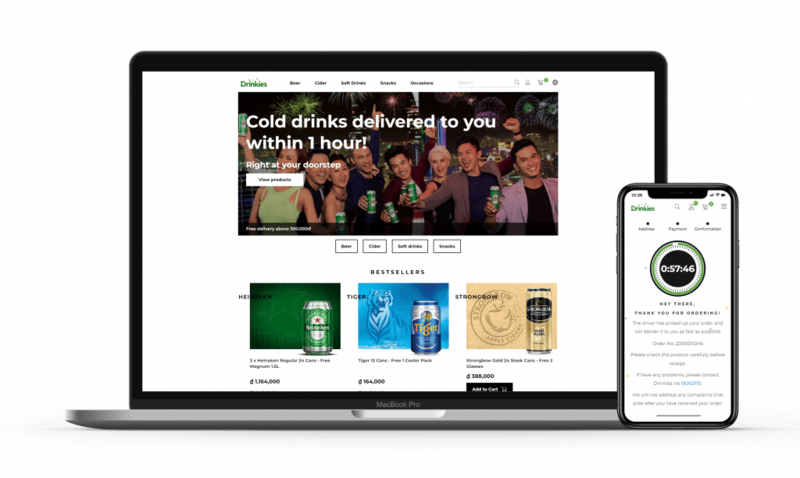 Also working on the project are Vaimo – a Magento 2 Global Elite, Valtech – Heineken’s digital partner while Heineken Global itself does the supervising work. “Cold drinks delivered to you within 1 hour!” Given the traffic condition in Vietnam, not a single company could make such a claim, the only merchant that ever come close is Tiki with its 120-minute delivery policy. So how does the company do it? To accommodate this strategy, Heineken has partnered with Satrafoods HCMC to gain access to its storehouses and outlets that cover all over the city. Satrafoods’ subsidiary, Satra Cold Storage, owns a set of 19 high-capacity refrigerated warehouses in Ho Chi Minh city. In the near future, the company is looking to cooperate with other major consumer good distributors Lotte and Vinmart+. With this forward-thinking move, the company can keep its business flowing without the need to own a single facility. To handle the logistics need for the company, we integrate the platform with major delivery service providers in Vietnam, for the time being, Ahamove and Grab. The integration allows the system to find the nearest and currently available driver to assign an order to him/her. Simultaneously, the system also locates the closest store. Both of these processes are to make sure the drinks stay cold when they reach the customer! For secure transactions, we integrate popular local payment gateways to their Magento 2 site – Napas and Momo Pay. Aside from the security benefits, the inclusion of these payment methods offers a more convenient way than cash transactions to customers. E-transactions also help prevent the situation in which an order could be refused at delivery. Visit Drinkies Vietnam and their Facebook page. We carried our past knowledge of the operation model of Drinkies Vietnam and applied it to Drinkies Philippines. 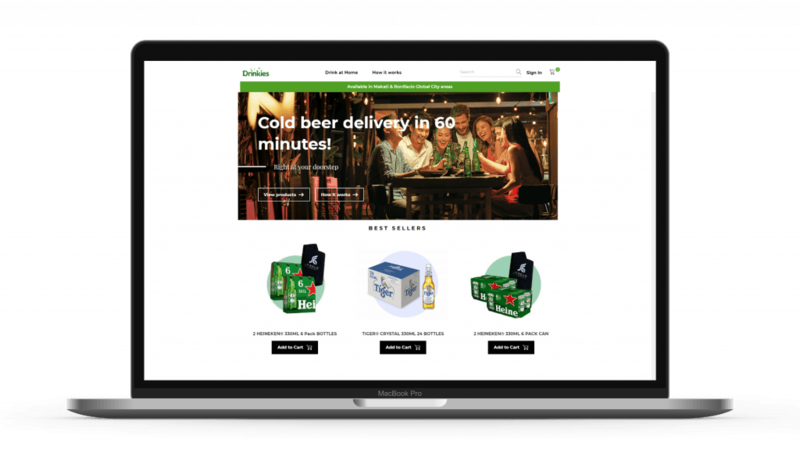 For delivery, Drinkies Philippines integrate their Magento 2 site with GetSwift. GetSwift is a powerful delivery management software for enterprises. The integration allows Drinkies to take advantage of GetSwift’s native solution for delivery dispatching and tracking while having invoices synced to Magento for financial information management. eGHL integration to Magento 2 helps Drinkies to process payment securely. eGHL is fully PCI DSS Level 1 Compliant. eGHL will process customer payment data on their server. This helps Drinkies reduce their PCI scope, as they only have to store basic information on their site. With our experience launching Drinkies Vietnam, it took us only 3 weeks to work on the project before the website went live. After Ho Chi Minh city and the Philippines, Heineken will deploy this service to major cities such as Hanoi in Vietnam and later to the entire South East Asia region. Magenest will continue to work with Heineken on their expansion as both a solution and technology partner.